The ACTFL guidelines say that at the Intermediate High Level our students will speak in paragraph length. Let’s assume that paragraph length means at least six sentences. How often do your students speak six consecutive sentences about a topic at any level? All students, even beginning first year freshman, can speak six consecutive sentences if we scaffold the speaking for them. Our students should be able to tell six things about themselves – name, age, their physical description, their emotional description, their birthday, and where they live. Most students can add something they like to do and how often they do certain things. Our beginning students can easily get up to ten consecutive sentences when they talk about themselves. Are students successful the first time they do these activities? Probably not. But as they use the scaffolding to practice, they develop fluency. Over time, they can spontaneously generate many sentences, more than a paragraph’s length. What do you do to help your students increase in the amount of consecutive speaking so that they reach at least paragraph length? 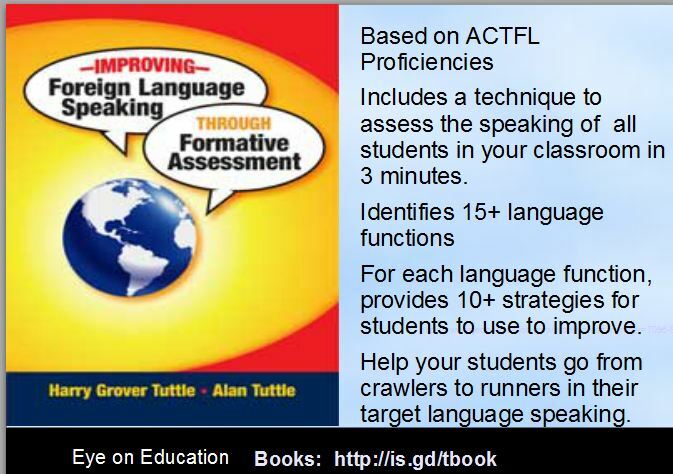 ACTFL’s 90% guideline indicates that teachers and students should speak 90% in the target language each class. However, such a guideline only addresses the language of the communication not the quantity or quality of the communication. Many modern language departments state that speaking is 20% of the final. So how much of each class should the students speak? Speaking, for me, does not include doing grammar or vocabulary drills. I propose that each student in a modern language class should speak at least 20 sentences each class. If a beginning student says 10 sentences in a two minute period, each student only needs to speak for a total of four minutes. If students work in pairs, each partner would take four minutes for a total of eight minutes for the two students. 8/40 is 20% of the class. Upper level students can say more sentences in the same time period. To reach 20 sentences per student, students need to work in pairs. Students can count their partners’ sentences and provide valuable feedback for improvement. If we start small by just having students answer basic written questions (Who? What? Where? When? How?…) about a picture and gradually progress to students spontaneous speaking about any common topic. How many sentences does each student say each class in your modern language class?